We offer free parenting classes through our iParent program. An advocate will walk through the video session you as you learn parenting tips and skills. Each class you will receive “baby bucks” that you can use in our store. 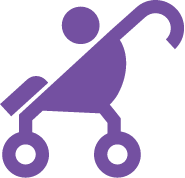 We are stocked with diapers, formula, wipes, clothing and other household goods. Parenting can be one of the hardest and yet most rewarding experiences you will ever face. Everyone can use a little support sometime. The subject of the classes varies from those that address all stages of pregnancy to the challenges of raising a grade school child. Some of these titles include: The First, Second and Third Trimester; Eating For Two; What’s Safe, What’s Not; Your Changing Body; Infant Temperament; Newborn Care; Mr Independent; Tantrums; How to End Biting; What Kind of Parent Are You; Compliant vs Defiant; …and many, many more. Please feel free to give us a call or email us. All information will be kept confidential. Thank you! Check your inbox to confirm your subscription to our newsletter! Enter your email address above to get updates from the Pregnancy and Family Resource Center. We promise, we won't email too often. © 2017 Pregnancy and Family Resource Center | All Rights Reserved.